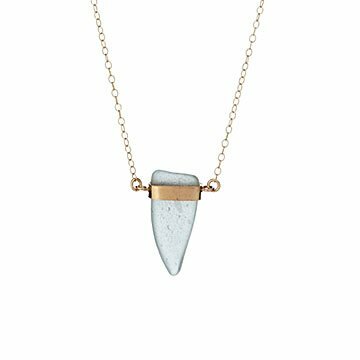 Ingrid Caduri places sea glass from the Panama Canal in a 14-karat gold-filled pendant. The journey of this sea glass is a mystery. It could have tumbled overboard an ancient ship. Or perhaps it broke off a bottle with a message inside. Now, it glitters around your neck. Ingrid Caduri's handmade piece uses sea glass she collected from the Panama Canal. Once she gets home to her studio in California, she sifts through the gems, selects her favorite bits, and creates a one-of-a-kind necklace. Send one to a beach lover or anyone that feels the call of the sea. Handmade in California. Though she lives in California, designer Ingrid Caduri spends a lot of time on the shores of the Panama Canal. This is where she collects the sea glass for her jewelry. “I boat between islands with bags of sea glass at my feet,” she says. Each of Ingrid’s pieces is completely unique and has a story. She hopes that when you wear her pieces you might receive a bit of positive energy from the sea. Pendant: .5" L x 1" W Chain: 18"